Here are the top 7 things homeowners can do to minimize the toll water, sunlight and termites take on your outdoor structures. 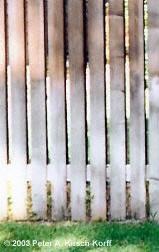 1 - Minimize unnecessary hosing down or wetting of wood surfaces. Whether standing or in the form of rain, sprinklers or hosing down - water leeches the protective oils, acids and chemicals out of wood. Below you can see how standing water is being resisted by the new application of deck oil while the next picture after that illustrates how sprinkler water discolors fence boards over time. This encourages the growth of mildew, fungi and rot as well as makes it easy for termites to invade. A new application of deck oil is helping this deck resist the water the sprinklers have left. Over time, the effect of a misdirected sprinkler can cause your wood to discolor and lose its protective oils. If you do want to have vines and plants draped over a wood structure, make sure you have it built to support the additional weight and apply a good protective coating before the plants cover it. 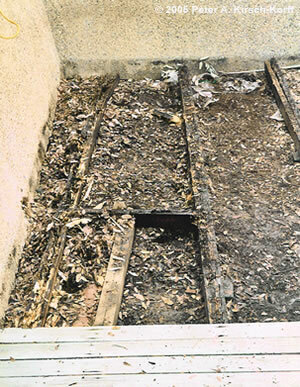 Dry Rot ~ The most common decay process is dry rot. Over time, the wood loses its protective oils and acids by water and the other elements. Then termites or other bugs move in and begin destroying the wood. Dry rot usually occurs where water has been allowed to accumulate and leech out the protective chemicals - usually at beam ends, and where beams or wood surfaces join. Brittle wood that can be easily broken or shredded is the most common indication. This shows how rot also takes its toll on frame members. Wet Rot ~ This process involves the wood being exposed to moisture on an ongoing basis, to the point that the water is breaking down the wood fibers. It typically occurs where wood posts meet the ground. 2 - Elevate or move containers that touch wood surfaces every few months. Planters require watering and hold in moisture, causing trouble spots for decay underneath them. So, to keep moisture from accumulating underneath the planter and discoloring the wood, move or raise them off the surface. 3 - Keep vines and draping plants trained off of wood surfaces. 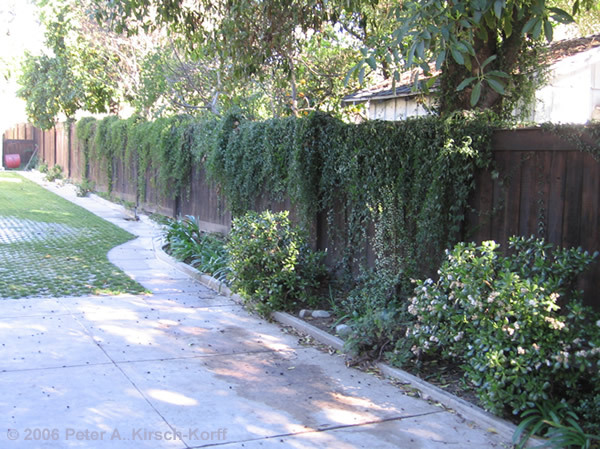 To allow the wood to dry, keep vines trimmed and away from wood structures. Since scrap lumber attracts termites, keep wood piles away from the wood you do not want termites to eat. 5 - Keep leaves and debris from piling up around the base of your project. Old leaves, grass clippings and dirt piled up at the base of of your project can keep the posts and trim from drying after it rains or the sprinklers are used. Here is a close up of rotted deck support framing and you can see the build of leaves and dirt has kept moisture in, accelerating the process. Without staining or maintenance, the soft gold tones of cedar turn gray. 6- Keep hinges and latches adjusted as well as screws tightened. Regular maintenance will keep the hardware working properly and avoid loosing screws if they start to back out. 7 - Reapply a protective coating (stain, preservative, linseed oil) to rejuvenate your wood every year. Oil is like moisturizing lotion for your hands -- so once a year apply a preservative to help protect your wood from weathering, aging and discoloring. Sunlight ~ As a secondary factor, the UV in sunlight also speeds up the aging process by evaporating the protective oils from wood and causing color changes. Wind ~ Although a relatively minor factor, air flow can affect wood by its ability to dry it out as well as acting as a strong force that can push against or lift up flat structures. Splintering ~ This damage is caused by the drying out of the wood and hard use that damages the surface. 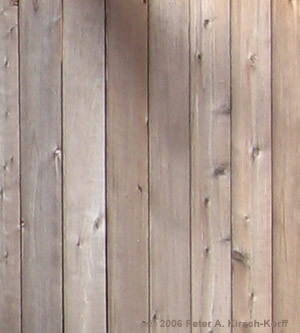 The lifting of the grain in a plank of wood can sometimes also lead to splintering. Warping & Cupping ~ This damage is also caused by drying as well as differences in moisture and temperature between the top and bottom sides of a wood plank. I hope these tips help you keep your wood deck, fence, gate, arbor or screen door in good condition. use my work for inspiration outside of the LA area. Serving the Los Angeles area communities of Altadena, Arcadia, Bel Air, Beverly Hills, Bradbury, Brentwood, Chino Hills, Claremont, Diamond Bar, Encino, Glendale, Glendora, Granada Hills, Hancock Park, Hidden Hills, Hollywood, La Canada Flintridge, La Crescenta-Montrose, Los Angeles, Los Feliz, Malibu, Monrovia, Northridge, North Hills, Pacific Palisades, Pasadena, Pomona, Porter Ranch, Rancho Cucumonga, San Fernando Valley, San Gabriel Valley, Santa Monica, Sherman Oaks, Silver Lake, South Pasadena, Studio City, Van Nuys, West Hills, West Hollywood, Westwood, and West Los Angeles.